Mmm, cocktails in a cake! I went to a barbecue in the summer and wanted to bake something to take along. I decided that cupcakes were easier for people to eat but wanted to make something summery and something that said 'party'.... which to me means cocktails! I took this recipe from Eat Me by Cookie Girl (Xanthe Milton) and adapted it slightly as I didn't actually have any Malibu and didn't want to buy a whole bottle for the 2tbsp needed, so I used rum flavouring instead. She also gave a recipe for icing sugar using caster sugar and egg white and Malibu, but I had some buttercream I needed to use up so decided that would work almost as well, and as I said I added a few drops of rum flavouring to it. Preheat oven to 180C. Cream butter and sugar. Mix coconut milk and egg and add to the butter and sugar. Don't worry if it looks a bit curdled like this, it's supposed to! The pineapple crisps and sort of curls up at the edges, which you can see on these cakes below. I piped on the buttercream but as it was a hot day it went a little runnier than I would have liked. I added some coloured balls and some paper cocktail umbrellas for that cocktail on the beach feeling! The letter for this month's Alphabakes is P, so my pineapple pina colada cupcakes are ideal! If you want to take part in Alphabakes and need to know the rules, check out my blog post from September 1st. 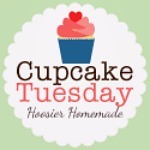 I am also sending these into Cupcake Tuesday, hosted by Hoosier Homemade. 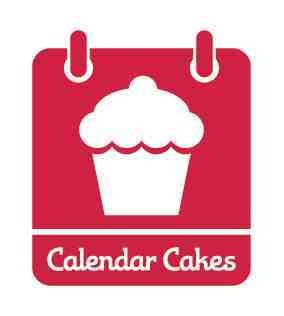 Calendar Cakes, hosted by Laura of Laura Loves Cakes and Rachel of Dolly Bakes also has cupcakes as its theme this month, in honour of National Cupcake Week which is Sept 17-23. So I'm sending them my pina colada cupcakes as well. 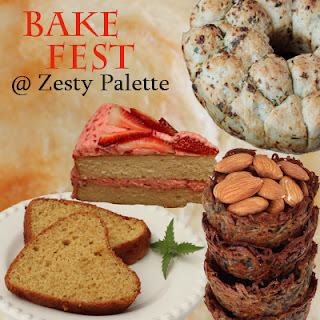 Finally I am sending this to Bake Fest, guest hosted this month by The Mad Scientist's Kitchen, as they accept as entries anything that has been baked. They must get so many entries each month! Thanks to Janine at Cake of the Week who left a comment on this blog post, I can also enter these in another blog challenge. She has started a new monthly challenge called Baking with Spirit, based around cakes containing alcohol (what a great idea!) and her first monthly theme is rum. So these pina colada cupcakes fit perfectly - at least I think they do, given I used rum flavouring and not actual rum - but hopefully it's the thought that counts! These look really tasty! I just started a blog challenge called Baking With Spirit and the theme this month is rum (or rum flavouring) so if you wanted you could add my blog challenge to the list of ones you've entered this into. I have Xanthe Milton's book and really like it - I found the Strawberries and Cream Cupcakes went down a storm. That's a great idea for a challenge- thanks for letting me know! I've updated this post to include it and will email you my entry as well. Already wondering what next month's theme will be! Lovely summery cupcakes, they all look so tasty. I especially like the cupcake umbrellas. Thanks Caroline. The cup cakes look delicious. I always assumed that these parasols are for drinks only! They look so pretty and summery. Thanks for linking to the event. Oooh I love the sound of these! Love the little umbrellas too! Great minds! I made pineapple and coconut cupcakes the other day too! Love your little umbreallas on yours (especially the polka dot ones!) You're bang on trend with your cuptails too!! I'm seeing lots of lovely cupcakes and cakes with pineapple at the moment - it's starting me craving pineapple! These look very pretty. How many of these do I have to eat to get myself drunk? I don't care I WILL eat them all!! !